Looking at my blog posts from the past, I have come to discover that this entry will be post #100. A lot has happened since the first post, and I hope I have entertained and informed you with my insight on all things Illini. So, on to this week's banter. Things are beginning to improve on the football field with Ron Zook's crew, and although the last two victories have been against in-state schools, it is, nonetheless, a start. 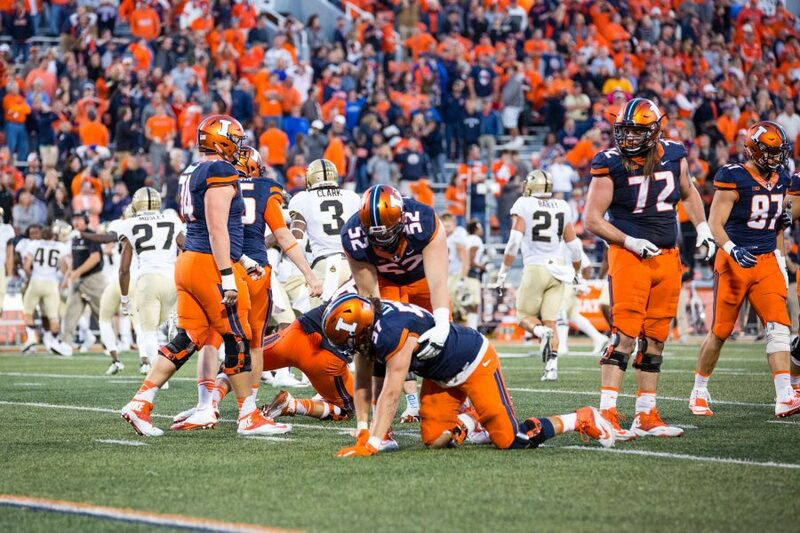 With the 35-3 win over Southern Illinois a week ago, the Illini began to regain some of the momentum that it lost when they were defeated by Missouri. Then, last Saturday, the Illini had to withstand a late rally by the Northern Illinois Huskies to squeak out a 28-22 win at Memorial Stadium. The Illini haven't started out with a winning record since the 2008 Rose Bowl season, so anything positive is good news. Both the offense and defensive units seem to be improving, and coordinators Paul Petrino and Vic Koenning appear to be getting their respective squads in check. Despite several injuries over the past few weeks, the health of the team is also improving, and it seems that Terry Hawthorne will be ready for Ohio State when they come to Champaign in two weeks. That certainly is good news for Koenning and his defense, who has been shuffling players in and out of the secondary since he went down. In fact, Jack Ramsey, who switched to defense due to the losses of Hawthorne and Supo Sanni, has switched back to wide receiver. In the win over Northern Illinois, some old habits cropped back up, and other persistent issues became more evident as the season shifts into Big Ten mode. Once again, the tight end was not utilized, and not one ball was thrown their way. One of the things that Petrino stressed before the season was that he would throw their direction more, something his predecessor, Mike Schultz didn't do much of. Not sure the reason why, other than they weren't open or were being used to block on the line for Mikel Leshoure to do his damage. Leshoure scampered for 180 yards on 24 carries, proving that the Illini like to get it to their workhorse, or as Petrino refers to it as "FTS" (Feed The Studs). Some quick observations regarding quarterback Nathan Scheelhaase through the first 3 games have been a mixed bag. Yes, he is a good scrambler and can gain yards in bunches that way, but upon further review, it has come to my attention that he is Juice Williams without the arm strength. Juice could throw the ball down the field and so far this season, Scheelhaase has not proven that he can do the same. The next stretch of games beginning with Ohio State (Saturday, October 2nd, 11:00 am) are crucial to making this happen, as those teams will be keying on the run and forcing Scheelhaase to pass. I think that the Illini can stay with Ohio State, but how long depends on the success of moving the ball against the Buckeyes. They can score points in bunches, and the defense will need to step up in a big way in order to keep the Illini in the game. With the Illini enjoying their bye week this coming weekend, it gives the team a chance to heal some of those injuries and get healthier before Ohio State comes calling. The stage is set for one of the biggest volleyball matches in recent memory this Friday evening at Huff Hall. The Illini will attempt to set an attendance record as they get closer to "History at Huff" when the #5 ranked Illini welcome #2 Penn State. The Division of Intercollegiate Athletics has sold 1500 general admission tickets for the match, including selling tickets online for the first time for a volleyball match. The Illini have not had a sellout at Huff since 1992, and if ever there was an occasion to surpass that feat, then this is the time to do it. The Illini have had an up and down week leading up to the important match, losing in 5 games to Cincinnati and defeating Louisville in 4 games in the Big East/Big Ten Challenge last weekend in Louisville, Kentucky. The Illini have been without outside hitter Laura DeBruler for the past few matches, due to her having mononucleosis. They are set to get DeBruler back for the big match against the Nittany Lions. Here's hoping she is ready for the challenge and can stop Penn State's 65 match winning streak in the Big Ten that spans the past 3 seasons. The stage is set for this week's activities. Here's to another 100 posts! Well, that was fun, now, wasn't it? The six year football series between Illinois and Missouri is now history, and the Tigers won all six games. This year, the Illini made it close, and for a half and some change, even led Missouri. The Illini, not expected to do much in the game because of a lean recruiting year, injuries to some key defensive players, and an inexperienced quarterback, suprisingly stayed with the Tigers for the better part of the game, but eventually wore down to a more experienced and determined team. Nathan Scheelhaase, who didn't do a terrible job in his first collegiate game, showed he has potential to scramble with the football. Some pundits have referred to him as "Juice Williams Light", or "Juice without the arm", which cannot be viewed as good news. Actually, I think he has a chance to be a special player, but as all college players go, needs some time to get comfortable. Something that was puzzling to me during the game was the inability to throw to the tight end, something that new offensive coordinator Paul Petrino promised they would do. Actually, only 3 receivers were utilized during the game, Eddie McGee, Jarrod Fayson and A. J. Jenkins. Petrino has a stud at the position in freshman Evan Wilson, so his philosophy of FTS (Feeding The Studs) didn't come to fruition. I don't think this was an oversight, but they could have looked his way at least once or twice during the game. When the Illini went into the locker room at the half with the lead, a sense of shock filled the pressbox at the Edward Jones Dome in St. Louis as to what everyone was witnessing. Could things be different? Former Illini and now Rams rookie tight end Michael Hoomanawanui arrived during the break and was as surprised as anyone. He stated that he was at Rams practice and had just gotten to the stadium, and was hoping that he didn't bring them bad luck. Well, that is another story altogether. The running game is not an issue, as Mikel Leshoure carried the ball 20 times for 112, but didn't get in the endzone. The only touchdown the Illini scored was on a 13 yard pass to Jenkins from Scheelhaase that capped off an 8 play, 82 yard drive. The Illini looked decent, sure, but a loss is still a loss, and as Zook said after the game, he is judged by wins and losses, not by how the team looked for a portion of the game. The natives are getting restless, yes, but some of that feeling can subside the next couple of weeks with home victories against in-state schools. These wins are certainly not a given, and a loss in either game will be deemed unacceptable. Speaking of unacceptable, that can be a good word to describe the actions of bandit defender Michael Buchanan, who was suspended indefinitely for a violation of team rules. Apparently he was out late on Saturday evening and was stopped by campus police for a DUI. Such behavior has been an issue with Illinois athletes over the past few years, and this can only be bad news for a defense that keeps getting thinner by the day. Clay Nurse will step into the bandit position in Buchanan's absence, while Whitney Mercilus will move to the end position vacated by Nurse. Illinois has a chance to get back on the winning track this Saturday when they host Southern Illinois at Memorial Stadium (6:30 pm, Big Ten Network). The Salukis are a power in the Football Championship Subdivision (FCS), or what was formerly known as Division 1-AA. SIU put 70 points up on Quincy University in their first game, and while it was a lesser opponent, according to Zook, "it is hard to score 70 points on air". The Salukis have some athletes on their team, and Zook said that there are some players on their roster that he would like to have on his team. They play a different style, and the Illini better be careful or they could be looking at an 0-2 start come late Saturday evening. Imagine how loud the catcalls will be then. Perhaps the most exciting action on campus right now is taking place in Huff Hall with the Illini volleyball team. Kevin Hambly has his squad playing very well right now, and they are coming off one of the most important wins in the program in recent memory. The Illini spikers went into Austin, Texas last weekend and knocked off the #2 Texas Longhorns. That win moved them up to #3 in the recent poll, and they have another stern test awaiting them this weekend when they travel to Lincoln, Nebraska to play in a tournament involving #20 Dayton, #7 Nebraska, and Western Michigan. If the Illini can come out on top in this tourney, they will be creating momentum for the big showdown on September 24th when top-ranked Penn State comes to Huff Hall. More on this as it becomes available. The Illini women's soccer team has been having a measure of success as well, going 5-1-1 through their first 7 games of the 2010 season. The Illini will conclude their non-conference road schedule this weekend with a trip to Cincinnati. The fast start by Janet Rayfield's squad has earned them the top ranking in the Great Lakes Region, the first such ranking in the program's history. More from campus next week.